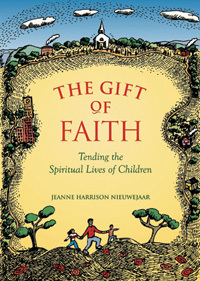 Eloquent and inspiring, The Gift of Faith celebrates the importance of nurturing our children's spiritual growth. This is a call for parents to be intentional, strong and clear in their choices regarding the messages that children receive about religion. By sharing her own stories and experiences, Nieuwejaar shows that religious community can play an integral role in clarifying and deepening the faith of parents, who inevitably are children's primary religious educators. She also explores ways to foster spiritual awareness in the home and includes rituals for marking the events in children's lives as religious occasions. This important book is ideal for adults of any faith who are concerned with the spiritual development of their children. Someone once said, “We are not human beings having a spiritual experience, but spiritual beings having a human experience.” What a rare and challenging notion that is! When I first encountered it, it seemed that the very ground shifted beneath me. The questions in this small book have to do with how we experience the balance of the human and the spiritual in our lives. Where and how do we encounter the holy? Where and how do our children feel its call, its majesty, its strength? To what extent do we, and our children, know ourselves to be spiritual beings? This book is written out of concern that, for most of us, the human side of the scales prevails in such a way that we are diminished. Even as we are surrounded in our living by incredible heights and breadths of thought and experience, art and science, we are impoverished if we lose touch with the holy within and around us. Before we discuss matters of our children’s faith, our children’s religious lives, let us look at just what is meant when we talk of these things—the spiritual, the holy, the religious. Let us acknowledge just how elusive these become when we try to capture them in words. Let us begin by reflecting not on definitions of the religious but on the more concrete phenomena of religious spaces and places. These, at least, are tangible, and easy to name and envision. Places of worship can be touched and smelled. They will not slip away as we approach them. They can be visited. Perhaps they can even hold the holy.